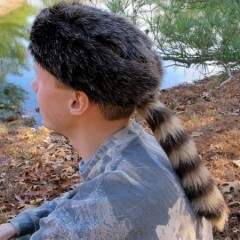 Crockett Coonskin Caps caters to the wholesale market. We offer great prices, reliable, prompt service, and friendly customer relations. Orders may be made via phone, fax or email. They may be paid for by credit card, PayPal, business check, money order, or by open account invoice for select companies. Samples are available to large accounts upon request. However our custom hats are not available wholesale, so they are not listed here. $6.00 (1001-up) The wholesale tails vary in size, but are generally nice tails.Call for volume or click on link to go to store order page. $4.50 (1001-up) These are dyed tails and are running 10-12 inches, and sometimes a bit bluish and sometimes even purplish. Call for volume or click on link to go to store order page. 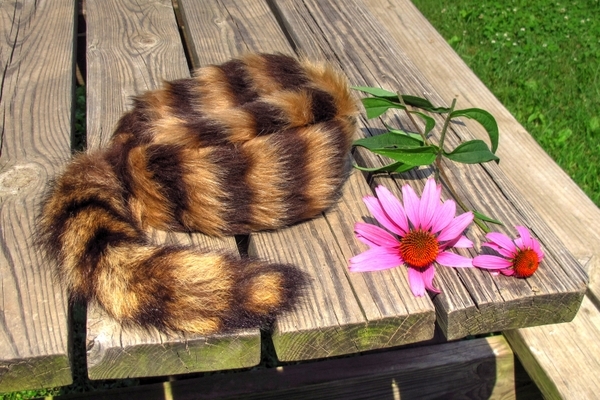 $13.00 $6.50 We make these tails right here in our shop. Call for volume or click on link to go to store order page. 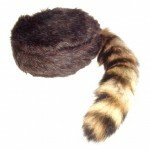 $9.50 (501-1000) This is a new fun cap for coonskin cap lovers. The wholesale tails vary in size, but are generally nice tails. 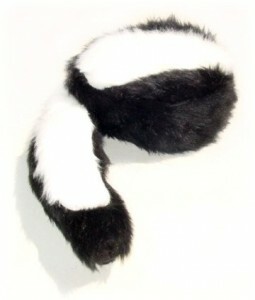 $24.00 $12.00 These Skunk Caps are made of acrylic black and white fur from the pattern we designed. Call for volume or click on link to go to store order page.